For Ubuntu users with Razer peripherals, here’s how to install the Linux driver and configure Razer peripherals in Ubuntu 16.04, Ubuntu 18.04, and higher. OpenRazer is an open source driver and user-space daemon that allows you to manage your Razer peripherals on GNU/Linux. See the list of supported devices. 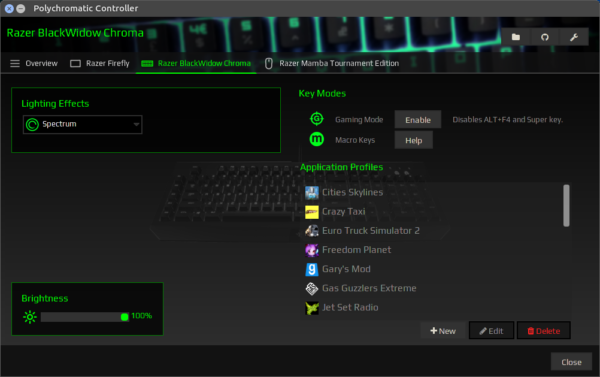 With Polychromatic GUI front-end, you can configure your Razer peripherals with a graphical tool and system tray applet. Type user password (no asterisk feedback) when it prompts and hit Enter to continue. Once installed, open polychromatic from your system application launcher and enjoy! And open Software & Updates, navigate to Other Software tab to remove the PPAs.